Telangana polls: No drainage, no drinking water to cost BJP's Raja Singh his seat? The residents of Goshamahal lament that their constituency didn’t develop under BJP MLA Raja Singh’s term as their legislator. 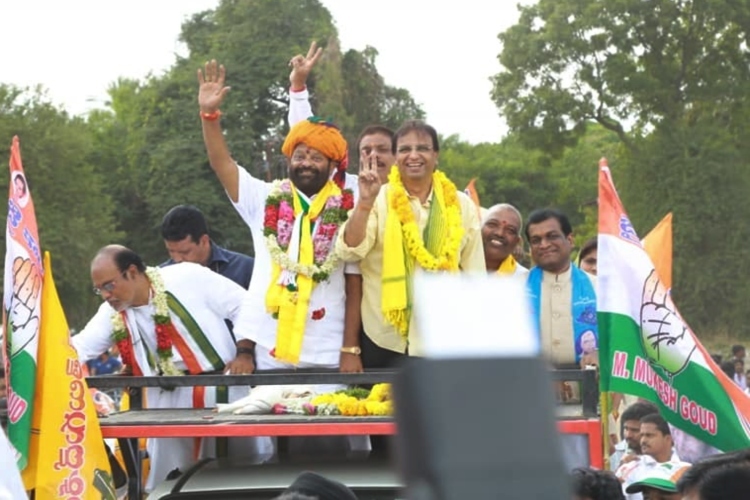 Showing his mighty strength, with an army of supporters, former Minister Mukesh Goud led a procession from the Ram Mandir in Sitarambagh on Saturday before filing his nomination at Abids, GHMC office. Goud is contesting from the Goshamahal constituency. He is a two-time MLA and lost the previous elections. Akin to his bike procession, a few days ago, the incumbent MLA and rival, controversial BJP leader T Raja Singh had filed the nomination before starting his rally from Hanuman Temple in Goshamahal, accompanied by BJP senior leader and poll strategist Ram Madhav. While one leader represents the soft Hindutva politics, the other is a Hindutva hardliner from the state, infamous for making hateful comments through social media, particularly targeting the Muslim community. He had made news recently when he promised of renaming Hyderabad as ‘Bhagyanagar’ if the BJP comes to power. However, these politics of Hindutva or soft-Hindutva doesn’t matter to voters of Goshamahal. They are more concerned about drainage system and drinking water. Goshamahal constituency was created in 2008 from Mahargunj Assembly constituency after delimitation. It comprises 7 divisions, namely: Dattatreya Nagar, Begum Bazar, Gunfoundry, Mangalhat, Goshamahal, Begum Bazar and Jam Bagh. “There is a problem of drainage overflowing and sometimes the drainage water gets mixed into the drinking water, this is one of the major problems in our constituency,” a resident of Goshamahal, who supports the Congress, tells TNM. “MLA Raja Singh ignored this problem and the residents have been facing the consequences,” he adds. Though this resident, who supports the Congress, is unsure if Mukesh Goud will be re-elected to power, he says that residents are likely to vote for those who promise and convince the voters of resolving these key issues will be elected. “Who cares what Raja Singh says, ultimately what matters is if he has done any welfare,” says Abu, a resident of Aghapura. He says that Singh will face a defeat as he hasn’t delivered on his promises. “His own people are not happy with him,” Abu says. According to Abu, the Lodhis, the community to which Singh belongs to, are dissatisfied with him. The Lodhi community have been traditionally brewing arrack in Dhoolpet. However, the state government cracked a whip and forced them to shut down their operations, leaving several of them unemployed. The community was offered rehabilitation in the form of alternative jobs. However, very few of them were provided jobs, according to Abu. The Aam Aadmi Party, headed by MM Hussain from Goshamahal, has also been effectively galvanizing a possible anti-incumbency wave in the constituency. According to the party workers, they have assigned 10 party workers for each division, who have been campaigning to elect AAP. According to the residents of Goshamahal, Hussain has the public goodwill and his supporters too, have been campaigning based on local issues like drinking water, better drainage facilities and the revamping of government schools. Another activist joins in and adds, “The people here are quite unaware of what they are entitled to and what welfare schemes are there, which we have been helping them with. We help them with information like which office they should approach when they have a particular problem, etc. So, the people see us as an alternative,” he says. While the AAP is confident about pulling off a Delhi-like win from the constituency, they seemed have galvanized the anti-incumbency sentiment against sitting MLA Raja Singh. Making his victory harder is former BJP MLA Prem Singh Rathode, who defected to the TRS in 2016 and is contesting from Goshamahal on a TRS ticket. Rathode had lost the 2009 elections to Mukesh Goud with a margin of 20,488 votes. However, the two-time legislator from the then Mahargunj Assembly constituency is still considered a heavyweight. Goshamahal, which is part of the old city, adjoining Nampally, has more than 3 lakh voters, and the majority of them are Hindus. It is to be seen whether Raja Singh’s politics of ‘Muslim-bashing’ would help him come back to power or will local issues be his Achilles heel.